A monoclonal antibody infusion targeting alpha-synuclein (AS) lowered the level of serum AS by up to 97 percent in people with Parkinson's disease, with greater and long-lasting reductions seen at higher doses in a small safety trial, setting the stage for a larger phase 2 study. A monoclonal antibody targeting aggregated alpha-synuclein (AS) is safe and tolerable, and enters the central nervous system in people with Parkinson's disease (PD), according to a study published June 18 online in JAMA Neurology. The results set the stage for a larger efficacy trial, according to experts, although the lack of an AS imaging marker presents serious challenges to tracking the efficacy of this or other therapies targeting the aggregated protein. The antibody treatment is meant to interrupt the prion-like spread of misfolded AS, which many researchers believe is central to the neurodegenerative process. That hypothesis is based on over a decade of work in animal models and autopsy studies in people with PD, suggesting that, as with the prion diseases themselves, misfolded AS from one neuron can be released and taken up by another, where it induces misfolding in endogenous AS. Several biotechnology and pharmaceutical companies are developing antibody-based treatments for AS aggregates, including Prothena Biosciences in partnership with Hoffmann-La Roche, the sponsors of the current study. The trial enrolled 80 people with PD, who were randomized approximately 2:1 to placebo or the humanized monoclonal antibody PRX002, infused monthly for three months. Patients receiving active treatment were grouped into six cohorts, with each successive cohort receiving a higher dose, to a maximum of 60 milligrams per kilogram. The treatment was safe and well tolerated, with no serious or severe treatment-emergent adverse events. Treatment-emergent adverse events that were more common in those receiving active treatment included rash at the infusion site, one acute allergic reaction, and dysgeusia. The antibody was cleared as expected over time, at a rate indicating that monthly infusions would maintain the desired minimum concentration in the bloodstream. Lumbar punctures at approximately week nine indicated that the antibody was present in cerebrospinal fluid at 0.3 percent of the concentration in the serum, roughly the same as seen in antibody trials of Alzheimer's disease, Dr. Jankovic noted. Antibody infusion lowered the level of serum AS by up to 97 percent, with greater and long-lasting reductions seen at higher doses. That was not true in the cerebrospinal fluid, Dr. Jankovic noted, where there were no statistically significant changes compared to placebo for free AS; total AS declined only in one of the intermediate-dose groups, and there was no dose-dependent trend. “This is the first pathogenesis-targeted study in Parkinson's disease,” Dr. Jankovic said. “If you accept the hypothesis that aggregation of alpha-synuclein plays a role in the disease, then targeting it is the next logical step. I think that's the most important message of the study. The fact there is some target engagement, as shown by a reduction in serum alpha-synuclein, and that the antibody is getting into the central nervous system, is also encouraging.” These positive results, combined with a good safety profile, “support going forward with a larger study to test efficacy,” he said. That trial, called Pasadena (https://clinicaltrials.gov/ct2/show/NCT03100149) is underway, and is expected to be completed in 2021. The study includes multiple clinical and pharmacokinetic endpoints, and will include dopamine receptor imaging. But it will not include any direct measurement of AS aggregation clearance, because there is not yet any imaging marker for any form of the protein, Dr. Jankovic said. However, Dr. Standaert noted, one must also target the right conformation of that molecule. “The whole question of what exactly is the form of misfolded synuclein that is toxic is still not completely settled,” he said. Success also depends on getting the antibody to the right place at the right time, and there is much that is still unclear about prion-like spread of AS in the human brain, Dr. Standaert said. “If the antibody clears only extracellular aggregates, rather than acting intracellularly, it may slow spreading, but not have much effect on the death of neurons already afflicted with aggregated protein. But slowing the disease would still be a groundbreaking accomplishment. •. Jankovic J, Goodman I, Safirstein B, et al Safety and tolerability of multiple ascending doses of PRX002/RG7935, an anti-α-synuclein monoclonal antibody, in patients With Parkinson disease: A randomized clinical trial https://jamanetwork.com/journals/jamaneurology/fullarticle/2685097. JAMA Neurol 2018; Epub 2018 Jun 18. 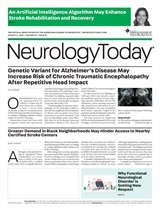 Neurology Today18(17):6-8, September 6, 2018.